0.5/5 Warmth Rating What is this? Collectif 'Sabine' Vintage 70s style Kimono in navy with classic Retro palm print conjuring up an exotic Hawaiian shirting flair. A stunning cover up option, this lightweight summer kimono features stylish tie belt, wide sleeves and dropped shoulder seams. 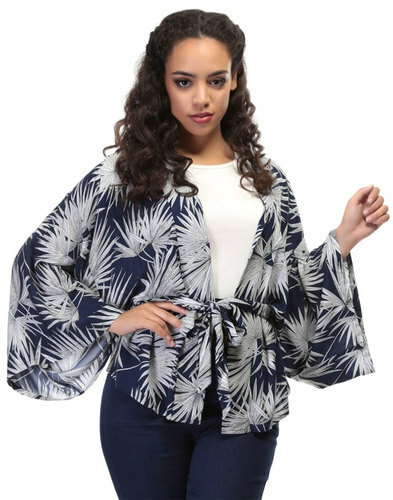 A beautiful relaxed fit garment, the Collectif 'Sabine' Kimono jacket is perfect as a lightweight cover up layer to take on your hols to a tropical oasis! - Collectif Vintage 'Sabine' retro 70s palm print kimono. - White palm print on navy ground. - VSS170603B Sabine Palm Print Kimono.